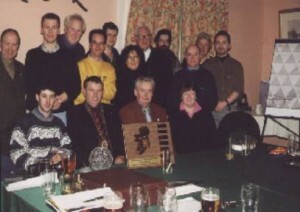 The Slievenamon Perpetual Trophy was presented to Dave Moore (EI4BZ), IRTS President on the 7th of February ,2001 during the occasion of his visit to a group meeting in Clonmel. In times where Amateur Radio band allocation is so often being scrutinised we hope that this trophy will achieve it’s main function. We hope that this award will in part encourage activity on the 70cm band and also create some enjoyable days during the month of July. 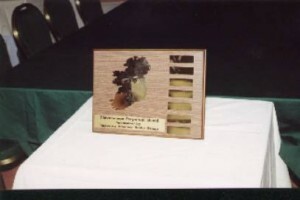 This trophy, the “Slievenamon Perpetual Trophy” is to be awarded to the station that achieves the highest number of points in a 70cm’s only competition. The purpose of this donation is to promote activity on the 70cm band. Tipperary Amateur Radio Group is one of the foremost promoters of 70cm’s activation in Ireland today. Most TARG members are now regularly active on 70cm’s and indeed the national IRTS News service is only broadcasted on 70cm’s from south Tipperary.